Two soldiers from the Yorkshire Regiment have been honoured for their bravery during a tour of duty in Afghanistan. 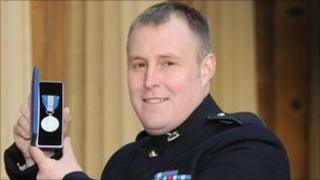 Captain Colin Lunn, 26, of Doncaster, was awarded the Military Cross for charging two Taliban machine gun posts. Corporal John Hardman, 32, from Scarborough, was awarded the Queen's Gallantry Medal for going to help a soldier who stepped on a bomb. The soldiers received their honours at a ceremony in Buckingham Palace. In January, Cpt Lunn, a team commander, charged the Taliban machine gun posts with two men from his unit, killing the insurgents. At the start of his deployment in October last year, Cpt Lunn also crossed a road three times while being fired at by enemy fighters as he helped direct an operation. Cpl John Hardman, 32, from Scarborough, received his Queen's Gallantry Medal for going to the aid of a British soldier who had stepped on an improvised explosive device (IED) while on a patrol near Gereshk in November 2009. Cpl Hardman said: "One of the guys trod on an IED and he lost both legs in the blast. "I was right behind him and it took me a couple of seconds, which felt like minutes, to get myself together. "I thought I'd set something off but I went to help him and luckily he survived and is now going through rehab."